Dozens of people lined up outside the Durham County Sheriff's Office Thursday to turn themselves in for tearing down a statue of a Confederate soldier this week, in solidarity with Takiyah Thompson, a member of the Workers World Party and student at NC Central University who was arrested Tuesday for her part in the act and faces felony charges. 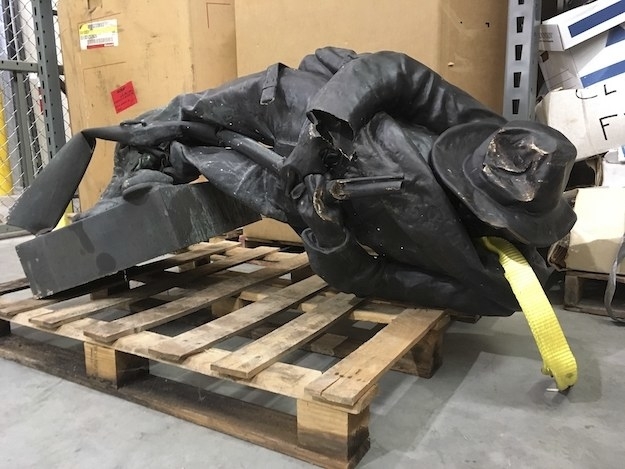 Sebring said that she and the dozens of people lined up were prepared to take responsibility for the statue's removal, despite not being present or directly involved on Monday. The statue of a Confederate soldier was in front of the courthouse in Durham and had been erected in 1924. Protesters gathered Monday, tore the statue down, and then kicked and spat on the fallen monument in a demonstration against the violence in Charlottesville that left one woman dead and 19 others injured. Bree Newsome, the Black Lives Matter activist who tore down the Confederate flag outside the South Carolina statehouse in June 2015, tweeted in support of the action. Dozens continued to line the halls of the courthouse throughout the day. Thompson was charged with two felonies: participation in a riot with property damage in excess of $1,500 (Class H) and inciting others to riot where there is property damage in excess of $1,500 (Class F), according to reports. She also was charged with two misdemeanors: disorderly conduct and damage to real property. The Durham County Sheriff's Office released a statement Thursday saying the official supports the right to peaceable assembly.